Balluzzo Grabs Fifth Win This Season On A Night Full Of Fireworks. Hampton, VA – While the Late Models had the weekend off at Langley Speedway, fans packed the stands for what turned out to be a firework filled evening. On tap for the evening, a 50 lap Modified feature where Shawn Balluzzo looked to add yet another feature sticker to his ride! We all knew we were going to see a great fireworks display from the Zambelli Brothers in the air, what we didn’t expect was a wild night on the track! Balluzzo was yet again the car to beat in all but one practice session turning a lap time of 16.400 in session three. Thirteen cars were set to take the green flag later that evening when two teams, who are constant top five cars, ran into trouble early. Both Mark Wertz & Danny Harrell had engine issue during practice. Wertz told Facebook & Twitter that the engine had problems that were not able to be fixed at the track, so to avoid any further damage Wertz had to pull him self from the competition. Danny Harrell also running into engine troubles had to wait for his team to bring a spare to the speedway. Getting everything swapped out and bolted down pretty much just as the last car qualified, track officials let Harrell through the tech shed and on the track. With the engine holding up Harrell would be able to take the green flag with no issues. Balluzzo was eighth to hit the track and didn’t take long for him to jump to the top of the leader board. Defending champ Robbie Babb would line up to his outside, Mike Rudy who makes his return to Langley would take the green flag in third position, Rookie of the Year leader Taylor Sarkees with a great qualifying run took the fourth starting spot, while Scotty Lawrence rounded out your starting five. The Mods were the final race to get underway that evening to conclude the Independence Day Celebration! Once again Balluzzo and his crew had his car on a rail! At times the #48 machine would pull to just about a half straightaway lead over the second place car. It’s just amazing the setup on his car, the amount of power the engine makes off of two. We were tuned in to Shawn’s crew during the race, I will say this, there was a little bit of concern for the motor during the nights only caution when the oil pressure light came on. Nothing seemed to hurt the car and absolutely no smoke poured from the machine, Balluzzo went back to green and back to dominating the field. With the smoothest race of the evening Balluzzo sailed to yet another victory, taking home win number five and extending his points lead over Danny Harrell by ten points. Harrell, who had engine troubles as mentioned above would bring his machine home inside the top five, securing a fourth place finish. Mike Rudy, who attempted to give Balluzzo a run for his money seemed to drive the wheels off his #8 machine a few times to many into the corners trying to run Balluzzo down but would hold on for a strong second place finish. Robbie Babb would forfeit one spot bringing home a third place finish while Taylor Sarkees brought his #98 machine home with a fifth place finish. Who by the way has pretty much wrapped up Rookie of the Year honors sitting third in the points (185 pts). The only driver in my opinion to be able to give him a run for his money was the #4 car of Jon Largena who has not been seen in action the past two weeks (mind you that is three races… last weeks races were twins), and has fallen all the way back to ninth (113 pts) in the standings. Largena has claimed mechanical issues are what is keeping him from competing, my question for him though, with the few amount of races you have run this season do you cut your loses, sit the rest of this year out, work on the car and build the bank back up come back next year with your rookie status in tact? The Grandstocks, another division who have been putting on some great racing this season, had 40 laps on the score card last weekend. 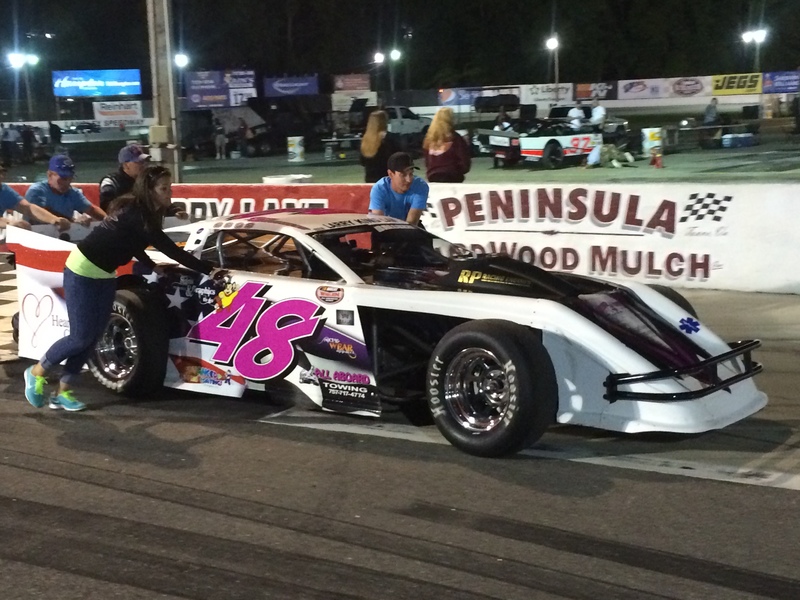 Points leader Mark Frye comes into the night looking to capture win number seven to the books. That my friends would be easier said than done! Frye would start the afternoon with the second fastest qualifying time right behind Brandon Hinson. Due to an inversion of two, these two drivers would simply swap positions. When the green flag waved Frye was able to clear the field off of turn four while Hinson started to go the wrong way. Lucky for Hinson, the #2 of Michael Waters comes to a stop in turn two with what looked like a flat tire. A quick caution would turn into a quick green flag as #1 Kevin Morgan found himself hovering over the turn three & four ditch, but not before Sweeney made the pass for the lead on the outside. The Grandstock division must have been sponsored by the company who makes the fabric for the yellow flag because we saw plenty of it! It literally took us about 15 minutes to see lap 5 on the board. This is just about the time Mark Frye wished he had a rewind button to do something different as his night went to hell in a hand basket! As the field went through two Rodney Boyd looked to lean on Frye who had the inside lane and looked to cut a tire down! Now pinned on the outside line the #54 of Billy Newman just barreling down the back nails Frye tearing pretty much all of the rights side of the car off. As we got back to green Sweeney was looking good at the point, a little loose but good none the less until a tiny bit of contact between him and German sent him spinning for what was that… another caution. Now is when Mark Frye’s night went from bad to worst! I wouldn’t even say the field got a full two laps in on the restart a huge wreck in turn that involved Mark Clarr’s rear tire sitting on top of Fry’s windshield. Heavy amount of damage to just about everywhere on Frye’s machine would pull him from the competition, as well as the #7 machine of Clarr! Back to green flag racing as Waters and Condrey attempt to improve their positions using the cone but just cannot make the outside lane work and fall backwards. German runs into issues as he lets out a huge plume of what looked like steam, he has to bring his machine down to his crew taking his chances away for a victory. Brandon Hinson & Jamie Sample would check out from the rest of the field and finish that way respectfully, Hinson collecting win number two on the season. The lack luster INEX Legends had 25 laps on the books for the evening. Now I say lack luster because there were only like seven cars taking the green flag, when in seasons past we saw 13+, just makes me sad because outside of the Late Models these were my favorite series to watch. Chris Hildebrand placed his #71 machine on the poll again and rode from flag to flag practically un-challenged to capture win number three on the season. 2013 defending champ Spencer Saunders ran into trouble early, he clipped the bumper of a spinning Matt Dail which would in turn send Saunders for a spin. Not to worry though, some hard laps and small car counts and a yellow flag allowed him to salvage a second place finish. Tommy Jackson, Jr who sits on top of the points standings with two wins had a little incident with Brandon Gdovic that sent the #87 around, however due to the lack of car count it did not take much for Jackson to climb back up to fourth with Gdovic finishing just ahead of him in third. Both the Bando’s and Karts seemed to have an issue running clean, more so in the Bando division! Race winner Bradley Wilson looked to have the field covered and would pull his machine into victory lane for the first time this season. That moment would soon be brought to a halt when officials found illegal fuel in the tanks. Some other concerns for carburetors were brought up for the reaming drivers in the top five. I have heard things floating around on who has been declared the winner, for the credibility of myself nothing I have heard has come from a Langley Speedway official, with that being said as far as The Weekly Racer is concerned, that race is still unofficial. Didn’t take long for these HRKC Wing Champ kart drivers to mix things up! Soon as the tail end of the pack exits two, karts get tangled and start spinning, one kart gets flipped and comes to a halt on his side. #34 Tony Spechio III, was the driver who went for that wild ride, he was able to get out of the kart under his own power and told the tower he was okay. Typical multi-caution race for these guys as they are literally pushing each other down the track. What I found to be especially strange was the double kart spin, one on the front stretch the other on the back stretch, both at the same time. Luckily for race control no damage was done and both karts were able to return to action without the need of a caution. Aaron Leach was able to hold on to grab another victory this season, Jake Harberts (filling in for Harry Leach), Jonathan Mullet, Angela Marie Steele, Shawn Gervais rounded out your top five.